Total capacity approx. 5.9 fl. oz. Recommended pour 0.75-1.5 fl. oz. Just what is meant by doubled wall ? Is there an air space in between the inner and outer? Thanks Ron. BEST ANSWER: The Norlan Whisky Glass (set of 2) is formed with a glass blowing technique into two separate two-part molds: one for the inner wall, and one for the outer wall. This glass greatly improves the whole experience of drinking your favorite whisky. The height and diameter of the smallest aperture focuses the aromatics to the nose while simultaneously diffusing the ethanol away from the face, fantastically improving the taste of your whisky. Ron, yes there is air space between the two (inner & outer) "glasses". There is a plug on the bottom of the glass that the instructions say is acrylic. Glasses can be washed in the dishwasher, but they are very light-weight and may fly around. Yes, double wall -- there is a space between them. The inner compartment is kind of a tube like. Fits in the hand nicely to me. Yes, inside is cold and outside is not. Gives it different lines and look and nice to drink form. Yes, there are two separate surfaces with air between. I would recommend hand washing the glasses. Is this glass able to be engraved? BEST ANSWER: I wanted to follow up about the The Norlan Whisky Glass engraving. We WILL be engraving these glasses in the Spring. I just saw a sample and they look great. This should happen in the next few weeks. Any update on this? I would order these right now as a gift, but I would need to know pretty soon! The etched Norlan Glasses should be available within the next two to three weeks. That's great. Is there some way to be notified when they are available to order? Ray - I just checked with the merchant and the Norlan glasses with personalization will be available on April 24,2018. The Norlan Whisky Glass (Set of 2) is a featherweight double-walled hand blown glass. While the glass is sturdy, each wall is thin and breakage might occur during the engraving process. BEST ANSWER: The Norlan Whisky Glass (Set of 2) are lead free. They are hand blown glasses made from borosilicate. BEST ANSWER: No. It may appear to be because of the lighting. If you look at the drawing with the description for the product you will see that it is a double walled glass. This causes the lip of the glass to be a bit thicker than usual. That coupled with the lighting in the photograph is what is giving you the impression of a gold rim. Nonetheless it is a wonderful way to enjoy you favorite whiskey! Wine C, there is no gold rim on this glass. It is just regular clear glass on the rim. Thanks! Nope.....plan glass through out......Photo illusion dealing with the gold rim! These are great glasses for whiskey. It’s not; clear glass which large ice cubes do not fit into. No. It is completely clear glass throughout. Do they come in a box? I want it for a gift. BEST ANSWER: The Norlan Whisky Glass (Set of 2) do come in sturdy packaging. I don't think you need a gift box. Yes they are boxed. They have a wonderful rich feel and are light as a feather. Yes, they come in a box and I have gifted them myself. Lucky person. Nicely packaged in a tube. Would be good for a gift. Yes, they come in a nice cylinder. Yes these glasses come in a box. Can you use ice with these glasses? BEST ANSWER: Yes, Ice can be used in these glasses. There are times that I like a bourbon on the rocks. The insulating properties of this glass allows for a minimal amount of ice and the ice, if large enough, doesn’t melt much to water down the bourbon. The Norlan Whisky Glass (Set of 2) can absolutely accommodate ice. These are great glasses for anyone who enjoys drinking whiskey. I don’t see why you couldn’t as long as you don’t throw the ice in. Would be painful to break one of these beautiful glasses. I would imagine that you could, although I never have, as I bought these to drink my scotch neat. Small cubes fit but the larger square cube I usually use to drink whiskey does not. Yes. The space inside will easily accommodate ice cubes. Is it OK to use whiskey rocks in these glasses or do they scratch the surface of the inner glass? The Norlan Whisky Glass (Set of 2) is made from hand-blown borosilicate glass and it is not recommended to be used with whisky stones as they can damage the inner wall. My experience has only involved Scotch, neat. But the bottom of the glass is ribbed so you might want to wait and hear from someone who has used whiskey rocks to be sure. Hope this helps. reserve all of your rocks and put them in a fishbowl. then fill it with water... then put fish in it. the fish will give your fancy rocks good company. I would think it would be a bit small for the whiskey rocks, but don't think they would scratch. To me, it doesn't need the rocks. I don,t believe they will scratch the glass, but i never add ice or water to my Scotch. Have not tried rocks so am not able to answer. Can I get different initials on each glass in the set of 2? I would like to buy one for my wife and one for me...we have different initials. I was very skeptical about these glasses. They were supposed to create a whole new experience in my bourbon tasting. It did. The biggest difference is on the nose. These glasses cut down on the heat from the higher proof bourbons. No more nose hairs being scorched or sinuses becoming numb. And because of that you really can smell all the nuances in a bourbon! The difference between this glass and a glencairn when tasting is more subtle but still evident. I had some Old Forester 1920 abv about 57% on Monday in a Norlan. It was delicious. The next day I grabbed a Glencairn to a sip and itvsi much hotter and burning I poured it into the Norlan. It smoothed right out! The glass does enhance flavor. BUT on second use it cracked allowing a small piece of glass to lodge between the double-wall and I had to throw it away. Not worth the money. I am terribly sorry for the trouble with your order. I have issued a no charge replacement that should ship within 1 to 2 days. Again, my sincerest apologies. Cheers! Not sure how it does it but all bourbon's taste better in this glass. The nose is also wonderful no mater the bourbon price. Was skeptical but not anymore!!! My husband is a scotch consumer and is always on the prowl for a new bottle. It's hard to buy him a birthday present. I found these glasses to be attractive and unique. They also deliver a great whisky drinking experience. Just got the glass and poured Knob Creek which in my normal tumbler would have a nose of alcohol mixed in. I was hocked that once I swirled the whiskey in the Norlan glass, no alcohol smell, I got the full smell/bouquet of the Knob. I then tried cask strength Wild Turkey (Rare Breed at 112 proof). Again only nosed the whiskey. The only reason I gave 4 stars is the glasses are very light in weight. I would have preferred a bit more heft to the glass. I bought these to replace a broken Riedel Vinum single malt glass. Same price. These are light & flimsy feeling with a crude lip. Buy the Riedel instead. 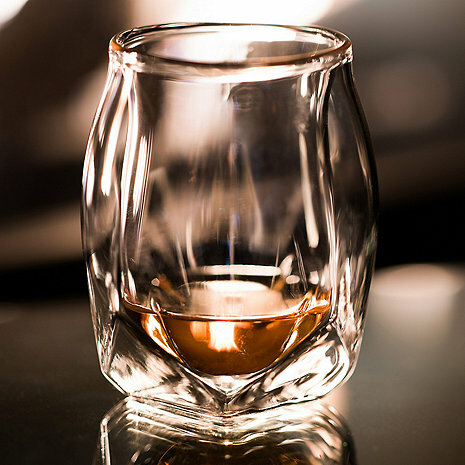 The glasses are nice, look good and have a nice feel in the hand, but don't really deliver a better nose or taste profile than the standard whisky glass. For the same money, I'd recommend getting 4 of the 'regular' whisky tasting glasses. Great small glass for enjoying your favorite brown liquid neat. You will be surprised at the increased sensory load using this unique glass provides. I highly recommend these glasses . They are very comfortable and easy to hold in your hand. They visually display your whiskey in a fun and unique way . They allow you to easily experience the aroma of your chosen spirit and it's very easy to get the last of your drink without tipping your head all the way back. I bought some for gifts to my friends and got some for myself as well. They also come in nice packaging which makes them appear very high-end as a gift. For the price you cannot go wrong . The glasses are unique. The glass material is unique. They get the attention of onlookers. They are particularly attractive when there is whiskey in the glass because the color is reflected in the rim. Drinking from them is a nice experience. The downside is that the glasses are very light and a little small. Men are used to drinking from a heavy larger glass so drinking from these takes some adaptation. All and all a a very nice glass but I fear some may think a bit effete for the drinking man. I would purchase them again and believe they should be in every drinkers whiskey cabinet. I bought these glasses for my husband who loves bourbon. He was excited to use them. Great gift. I really like my new Norlan Whisky glasses. They are very easy to hold, and look great too. They make the experience of enjoying my nice whiskies and scotch better. I appreciate the flavor of the scotch now since I've started using the glass. The smell of the Scotch is wonderful making the enjoyment of happy hour worthwhile. The glasses are pricey but worth it. You gotta love how these look and feel in your hand. They won't make an average whiskey taste like an exceptional whisky, but they do enhance the tasting experience. It's much easier to pick up the subtle nuances both on the nose and the taste buds. They also seem to help mellow the ethanol from more high powered spirits. Overall, I'm very pleased with the purchase and will probably get another pair down the road. They'd make exceptional gifts for anyone who likes whisky. I thought these glasses were a gimmick, but they really enhance the enjoyment of whiskey! Unique and beautiful glass design that concentrates ambient light in a way that allows full enjoyment of the color and clarity of the contents. I see these glasses as a complement to Glencairns, and not a replacement for them. That said, I would still recommend them highly. Bought these for my husband. They are gorgeous and my husband loves them for his bourbon. A nice addition to his bourbon bar. My son gave me a set as a present and I was extremely skeptical about the claims of the Norlan Glass. We did a sniff and taste test with the Norlan and a standard Glencairn glass and the difference was noticeable. Both in detecting the aroma and reducing the burn of whisky, the Norlan was superior. I bought these for a gift for my husband. He loves these glasses. He believes whiskey tastes better when he uses them. I bought these glasses for my son-in-law who loves to drink high end bourbons and whisky. I had purchased the Glencairn’s for him two years ago but thought he might like these as well. I just asked him how he liked the Norlan’s. He said he liked them so much he uses them exclusively. He did mention that if I was going to purchase them for someone else to make sure they liked to drink their liquor neat because the big ice cubes do not fit in the glasses. Best gift he has gotten in years! Husband got some for his birthday, asked for more for Christmas. He is very hard to buy for, but these glasses made him happy. They are beautiful glasses but mostly his whiskey seems to taste better in them. We also bought a set for both son-in-laws. The perfect Holiday gift ! Simple safe order process and fast delivery. Great customer service. Really light, definitely something to the science! The glass holds the aroma, keeps the liquid cold and the outside is not cold to the touch. They look good with many different lines. Very interesting to drink from- I like them. Great looking glass , ideal for drinking straight. Easy to hold. We use these glasses for our finer sipping bourbons. Actually does bring out the flavors much better. Lovely glasses. Bought for Christmas gifts. Highly reccommend. We love the size - light and fits easy in your hand. Purchased 2 sets for holiday gifts. Unique and stylish...perfect for bourbon! The presentation of the whisky in the glasses is amazing. The liquid appears to be floating in air. The visual is exceed by the delivery of the whisky. The bell shape captures the aroma beautifully and enhances the silky texture of the spirit. Norlan and Woodford is a sublime pairing. My husband LOVES this glass. Our friends came to visit for a few weeks, loved them too, so we sent them a set. Everyone is very happy. whiskey. Lovely to look at and lovely to use. Beautiful workmanship. Gives a sense of satisfaction to have a great whiskey in a great glass. Enhances the aroma and flavor. I think it does make bourbon taste better and they look great! I gave this set to my son in law. He likes them. That's all I know. My husband received these glasses for Christmas, and really loves them. He was not familiar with Norlan and was amazed to find that the glasses really do enhance the aroma and the taste of his whiskey. My brother-in-law declared them instant heirlooms! He loves the way they feel and look. He loves everything about them! Thank you! Awesome Christmas surprises for. My son!! He loves Irish whiskey so a fitting addition to his enjoyment! The Norman Whisky Glass was a gift. He really appreciated it, and they are beautiful. Yes, I would certainly recommend them. These were a gift for my nephew and he absolutely loves them! I've enjoyed single malt scotch whisky for a number of years. Even to the extent our dog is named Macallan. The Norlan Whisky Glass has taken this enjoyment to another level. Kudos! We really love these glasses. It really works to enhance whiskey and bourbon.